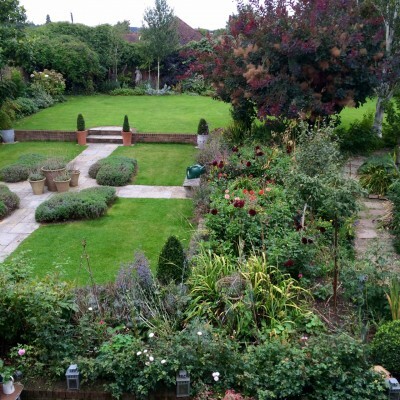 Garden jobs to start the gardening year don’t begin in the spring. They begin in October, according to Graham Gough of Marchants Hardy Plants. 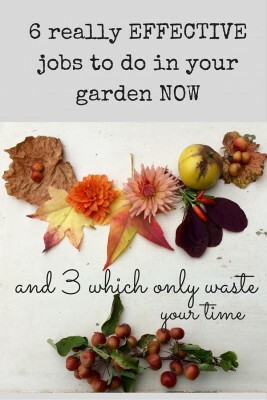 So I’ve asked experts in different gardening fields (ha ha) what we really have to do in autumn and what we can safely cross off the ‘to-do’ list. 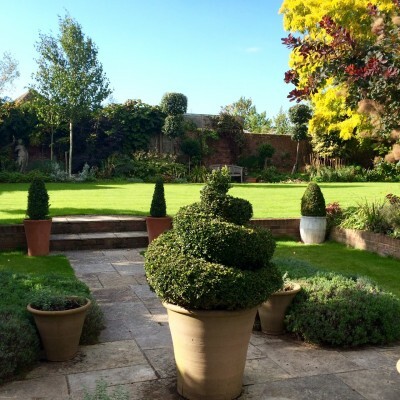 1) Garden design: Make a list of what worked & what didn’t in 2015. I’m a bit chaotic about taking notes, but I find that photographs make an excellent record of the garden. I find it helps to name each photo – this one is ‘garden August 2015’. Then you can quickly call up the month and see what the photos say. Graham Gough says that this is the best time to take plants out of the garden if you’re not happy with them. ‘You can still see where it is – in the spring, it may have disappeared under ground. Then fill the hole with good compost and you’ve got a wonderful planting spot all ready to plant up in spring’. Marchants Hardy Plants is known for its perennials. 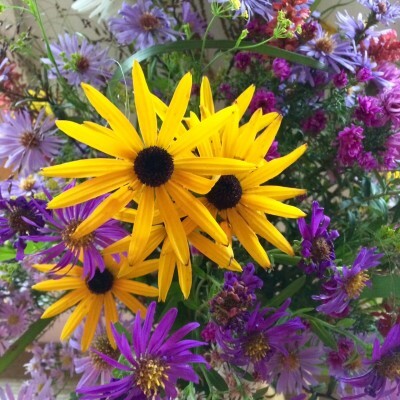 This is a gorgeous flower arrangement I spotted in their shed this week, made with rudbeckias and asters (now symphotrichum) from the garden. 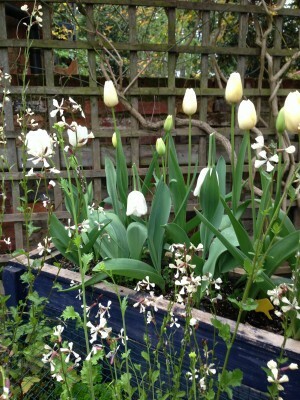 And plant all bulbs – except tulips – as soon as possible, say the RHS. ‘Every week of delay will reduce performance and longevity,’ say Guy Barter of the RHS. If you want to achieve a particular effect with bulbs or are passionate about growing specific types of veg, order seeds and bulbs now. You can always go back for the bargains in the sales. Once I’ve cleared the veg away for the year, I plan to cover the beds with flattened-out cardboard boxes (from our last bulk wine order). Saves a trip to the tip! Gardener and consultant, Harriet Rycroft, teaches online container gardening courses at My Garden School (find her on Twitter @harrietrycroft). She advises you to drag any pots with tender plants to a sheltered spot. I have had 3 bay trees here and the one that lives against the kitchen wall flourishes, while those further out in the garden died. 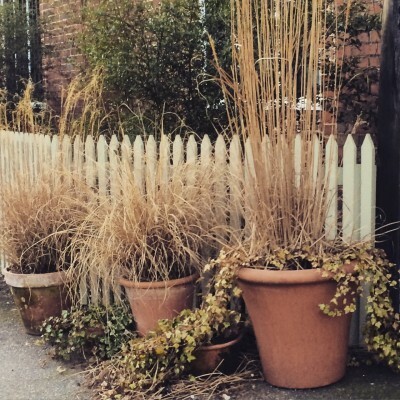 Outside the front of the house is also a good spot for winter containers (so that you can enjoy them when you go in and out). 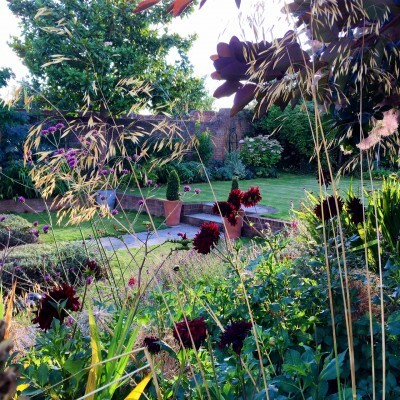 These evocative grasses were planted up by garden designer Graham Lloyd Brunt. Garden Organic say. ‘Unless you have very heavy clay soil, digging now is bad for it (and for your back!). If you dig now, soil nutrients will be leached away in heavy winter rain. They may be redeposited lower down the soil profile to form a pan, which will impede drainage in future year. 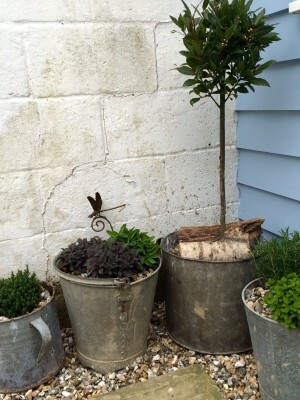 2) Pots: Don’t use compost with water-retaining granules in winter. ‘A surprising number of garden centres still sell this compost throughout the winter,’ says Harriet Rycroft. ‘Cold, water-logged compost will rot your plants and bulbs. And don’t use a ‘drainage layer’ of broken pottery at the bottom, says Harriet. ‘Tests have shown that this doesn’t improve drainage and I never bother. I do put just a few at the bottom to stop the drainage hole getting blocked with earth. This also makes it easier to push the plant out when you eventually need to. Pot feet don’t help drainage either – I’ve planted thousands of pots over the years and only ever use pot feet when I don’t want to mark the surface the pots stand on (for example, decking)’. Don’t use lawn weed treatments on the lawn, say the RHS. The weeds may be waving their cheery little heads at you – but they aren’t growing now, so weed-killers will be wasted. Save it for spring. Just hand-weed any that are defying the weather. Close-up we can still see some weeds in the lawn – but they won’t take weed-killer up now. In many gardens, the days of clearing away all the perennials in autumn are pretty much over – everyone seems to agree that it’s much better to enjoy some of the beautiful outlines of dead seed heads and grasses. Mounds of dead foliage help to protect the plants, and offer sanctuaries for wild life. Do share any slightly surprising tips you have, either here or on the Middlesized Garden Facebook page, where you can see extra pictures and stories about the gardens featured here. And I’d really appreciate it if you could share this on any of the buttons below – thank you! 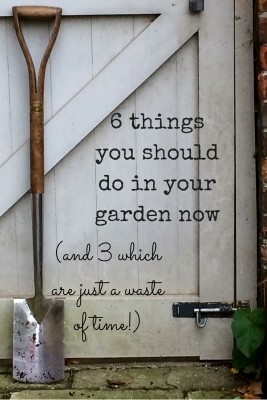 12 comments on "6 slightly surprising garden jobs you need to do now (and 3 which just waste your time)"
Perennials: Now is the time to take out a plant you’re not happy with – no – take them out as soon as you see they aren’t right, whenever it is, and replace them then. Bulbs and seeds: Order them now – bit late for all except tulips. 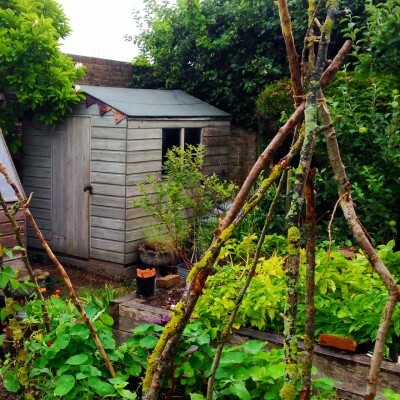 Garden jobs: cover your soil up for winter – keep your soil mulched always, all year round. Lawns: It’s your very last chance – only if you’re a bit nutty about the state of your lawn. Good advice, Anne, especially ‘take a perennial out as soon as you’re not happy with it’. I always feel really guilty about taking anything out that’s growing well…but the ruthless gardener undoubtedly has the better garden. Bulbs and seeds to order! Must get on with browsing through the catalogues! At least my lumbago gets a rest over winter. Great tips especially number 4! Brilliant inspiration!! Sadly I am on heavy clay soil so dig I must! Boo! I have to do so much tidying in my raised beds and vegetable garden but somehow no matter how much coffee I drink today it’s not happening, best intentions for tomorrow!! Yes, I gather that very heavy clay does require winter digging (I’ll add that in, thank you for reminding me.) I love your shepherd’s hut. I have often wanted one but it is really not suitable for a walled town garden and neither would I be able to get it through the garden door. Thank you for these great tips. I must get out and prepare my MSG for what sounds like the early arrival of a bad winter. Glad to have found you via the Weekend Blog Share! Thank you – yes, Weekend Blog Share is a good place to find good blogs, and I always find WWWblogs and Mondayblogs good too. And, by the way, I love the photography on your blog. Beautiful.